A simple black catsuit is applicable for so many different costumes. They are like a sleek black canvas for you to write the story of your character on. You can use them to be a hero, or you can use them to be a villain. You can even use them to fall somewhere in between. See, catsuits are perfect for fighting crime due to their skin tight fit. When you find yourself in a battle with an evil villain, you won't have to worry about whether or not your clothes will get in the way. This skin tight suit will stay clear through the whole fight. 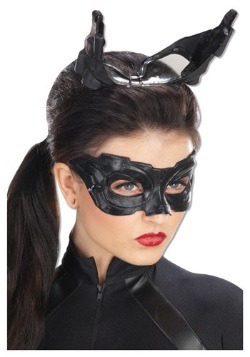 If you find yourself as a villain, well, we like to think you'd make an excellent cat burglar. This sleek black suit will help you move soundlessly through the night while you slide through the shadows, slippery as a snake. You'll be in and out with all the jewels you can carry before anyone even realized what was going on. This costume is nothing short of classic. Catsuits like these have been used by all sorts of characters to accomplish all sorts of tasks! This catsuis it made of 100% polyester and comes coated in black vinyl. It zips up the front and has elastic stirrups that fit under your feet to help hold it in place. Pair this with a weapon of your choosing and maybe a simple mask and you'll have a costume that'll be more than memorable! Alright, it's time to make a decision. You need to ask yourself: are you the hero, or the villain? Whatever you choose will determine your character, and in turn determine your fate. This is no small decision to make. Luckily, you don't need to decide right now! Sleep on it, reflect, then assume your new identity!